It was, by all measures, a pleasant Fourth of July. The day was filled with summer sweetness, as we whiled away pleasant hours down at our neighborhood pool. It was hot, just hot enough to feel like summer without being overly oppressive. Though the air was thick with sultry Southern wetness, the skies were clear, and cool breezes passed now and again. The pool was crowded, as it is on the Fourth. There were greased watermelon games, pie eating contests, candy hunts, relay races, and an agonizingly epic belly flop contest. There was also a "beer dive contest," which basically entails lifeguards throwing several cases worth of ice cold beer..cans, of course...into the water, and then the grownups dive for it. What you get, you get to keep. After tennis, and swimming, and contests, and more tennis, we recovered for a bit, snagged a quick dinner, and then went to my parents house. From there, we went to the nearby high school, where for the last decade or so we've consistently gone to watch fireworks. When we first went, the boys were tiny, and hid. Now? Now they aren't so much, but the ritual remains a vital touchstone of summer. Only it's different now, different even than it was five years ago. I noticed this after dark fell, and the surprisingly good Beatles cover band ratcheted down. The national anthem was sung by the crowd of many thousands, ten to fifteen thousand at least, all gathered on the football field before us. It was a wildly diverse gathering, reflecting the deep cultural richness of the DC area. And then, right on cue, the fireworks began. It was a big start, as it often is, to catch your attention. What caught my attention, though, was not the light in the sky. It was the flickering brightness from the field. I had noticed it a bit last year, but this year, it was inescapable. The darkened field was a sea of light, thousands and thousands of smartphones, all held aloft to the sky. Each was recording video, and so with every burst from the air, there'd be an infinitesimal lag, and the field would pulse back, as thousands of little bright rectangles echoed the moment that had just occurred. Through the entire opening display, the sky stuttered and spit with light, and the thousands of screens pulsed with it. It felt...strange. There was a peculiar sameness to it, to this compulsion to view and record and share, every screen an echo of every other, magnified by the thousands. 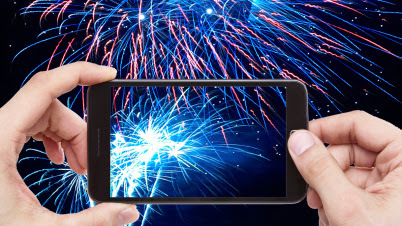 Thousands upon thousands, not in the moment fully, the celebration of fire in the sky filtered through a screen and the expectation of sharing data. It seems worth marking. Worth taking note. The Faith of Corporate "Persons"